Your landscaping work is very nice! 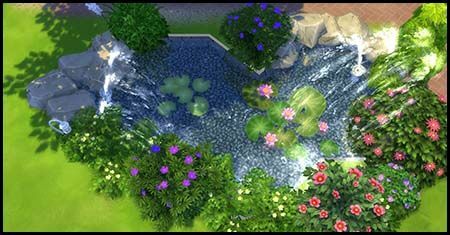 @VioletRed The natural pond theme of the pool is very nice! 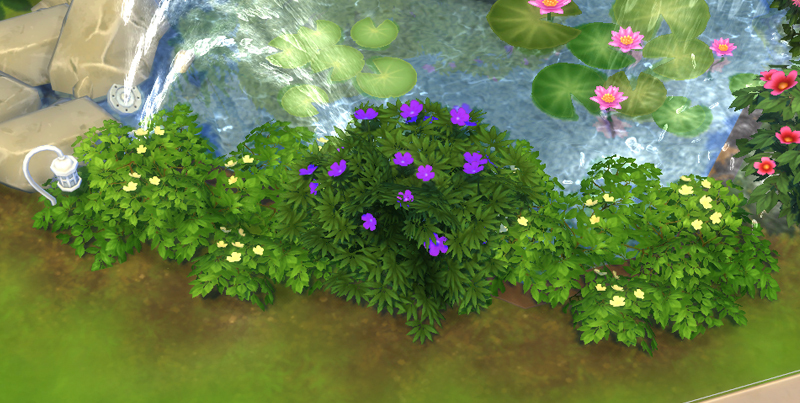 The plants look very nice how they are placed on the edges of the pool water and the lilypads look great in the water. The type of plants suit very well the theme. 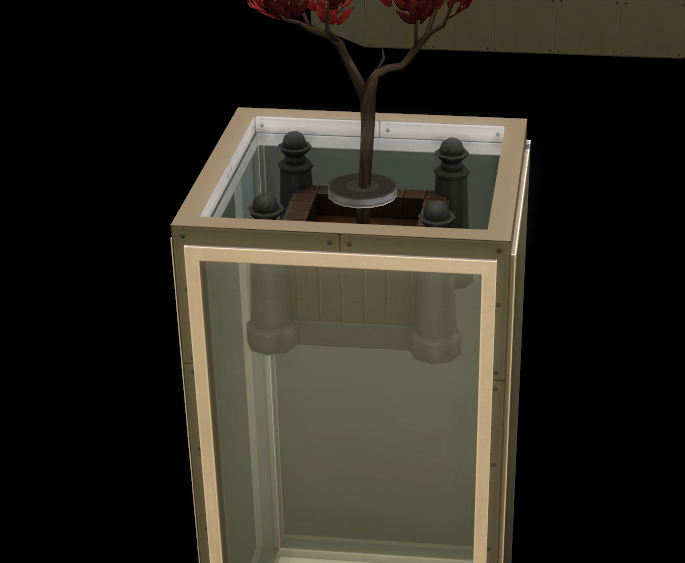 The water feature window looks nice on the edge of the pool. 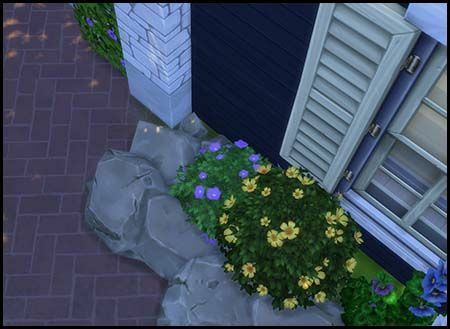 Nice sitting area for sims to relax in the outdoors air. They will have fun playing the llama tabletop game. The tiling is a nice touch under the table. 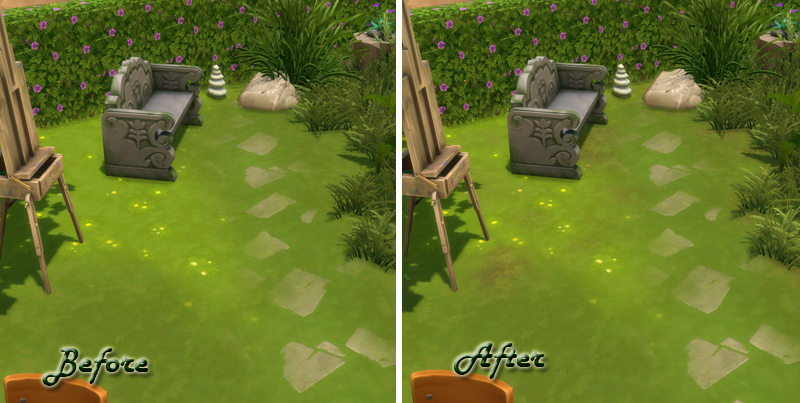 Nice art area for sims to enjoy painting on the easel under the shade of the tree. 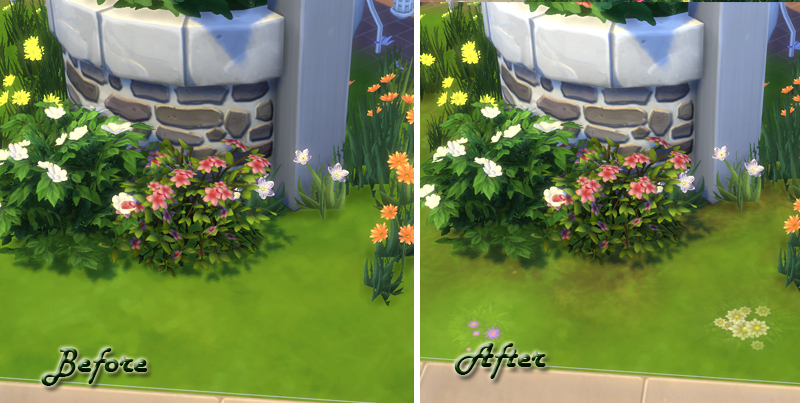 Ok made the fixes and some changes, sorry I had not landscaped the whole lot. Upload is coming up. And the critiques can be public, I'm good with it. I uploaded the lot but I'm can't figure out how to link it like I see some people do, hopefully its not a PIA to look for it via hashtags. You need to untick the Maxis curated box in the advanced section for the build to appear when searching. @rosemow Will do for the next upload, Thanks!! 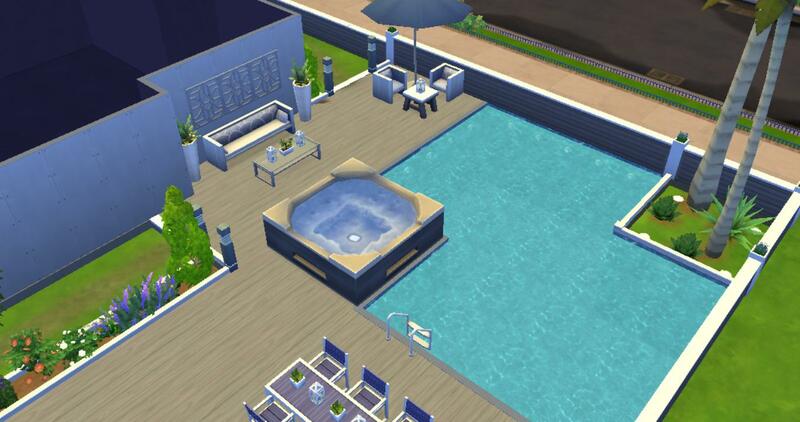 @Artemis_Dreamer I just had a look at your updated lot, and yay nothing dropped for me which is wonderful and I like the lights on the columns around the bbq area. 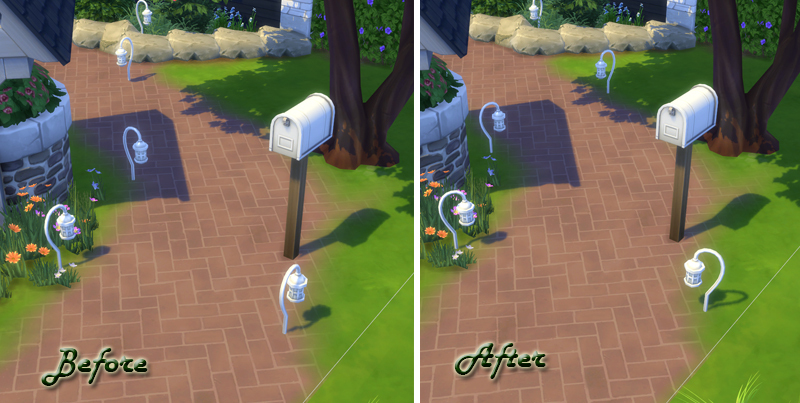 You made the adjustments to things like the mailbox and flowers through rocks. Great job n the roofing for the bbq are though the main reason I said it was for the hanging plants so they looked like they were attached to something hehe. 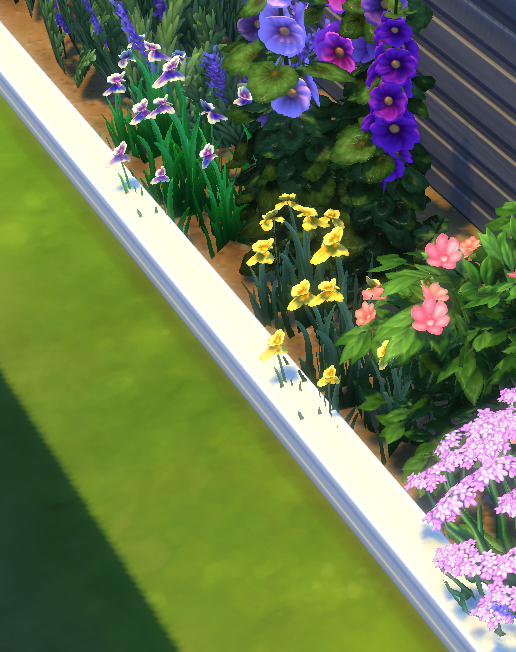 Love the clutter on the tables to, I didnt comment on the pipe on the side of the house as that would be considered part of the exterior challenge but good that you fixed it up. Oh and @steskens sorry I missed your post to with the interior from challenge 1, sorry been all over the place this week lol. I hope you dont mind I posted here will send in private message is you prefer. 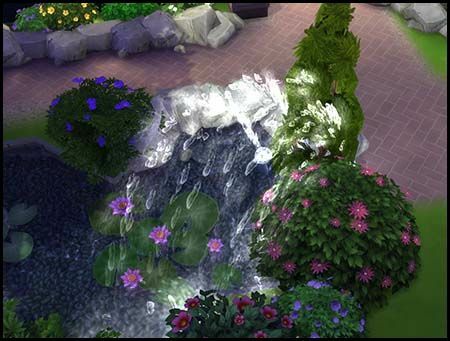 I love how colorful it is with the flowers, gorgeous garden beds with the rocks and love the pond. Ok will pick it apart and I know you are trying to work on the placement issues but I did find a few that you need to be careful with. 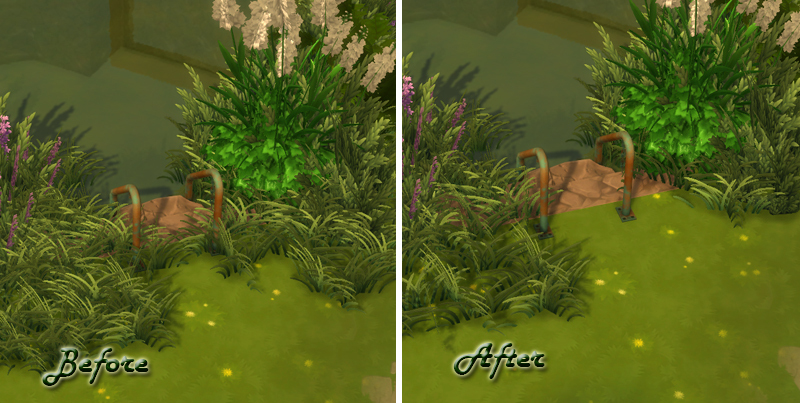 Becareful with lights sticking into plants and you missed a bit of the terrain paint on the path, because you lined the path with the fencing I would adjust the softness of the paint to the full side on the left which should help prevent this. I think you did a great job decorating nothing looks bare and it looks very pretty and the gardens look manicured. It is all mainly placement issues so just slow down and hold the ALT button down when placing to move away from other objects. Ok this is super cute, I love the cottage look and the blue with white is very beautiful. I love the wood used with brick and really effective using the brick columns then the different colored brick on the roof. 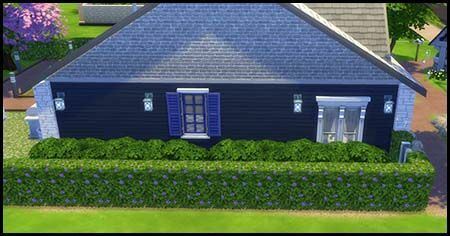 I love the dormers they look so cute the blue on the windows matches the exterior and flowers are pretty. 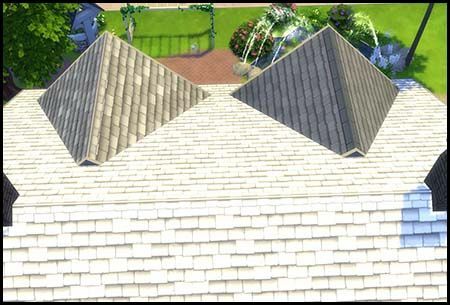 Be careful that you extend dormers enough that the end of them is hidden I can just see the end. 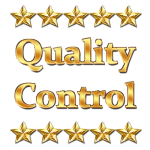 One thing we always check when judging is the night view, exterior lights also double up as great decoration to make your exterior look nicer and brighten the look. Here is before and after shots with lights at night. Overall though great exterior I absolutely love the colors and different wall coverings, the dormers are super cute and the chimneys add decoration. Great colors again suits the outside of the house, I love the blue, white and brown mix. Great kitchen you could even make your own shelving and decorate but I think you did a great job. 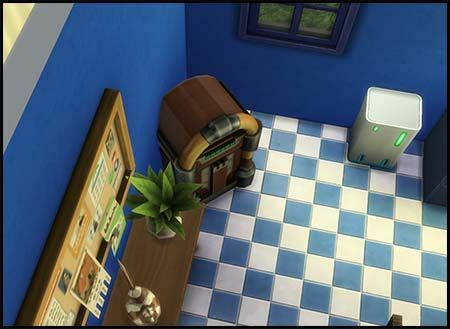 Also dont forget to place a fire alarm above the stove (unless you like watching your sims burn to death lol). I did find the jukebox is sticking into the wall and you can see the plant on the table sticking into the cork board. 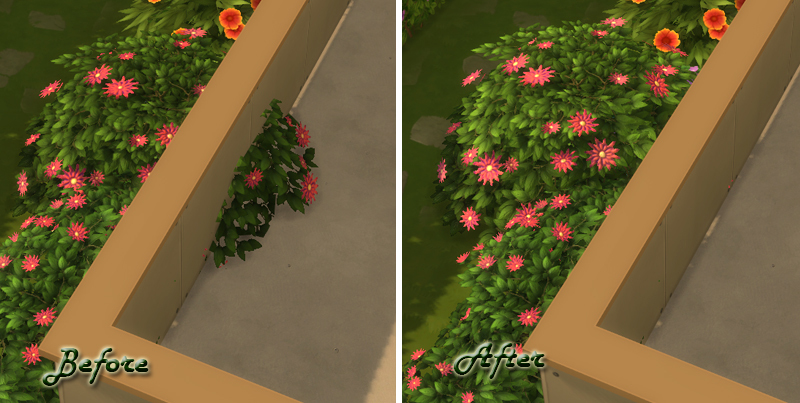 I noticed you used moo to move the potted palm away from the wall which is great, its a pet peeve of mine that they made some of these plant pots to stick out further than their one tile size because a few of them will stick into walls when placed on the tile. I would suggest that because you used curtains in the bedroom windows I would of continued that into the living room and kitchen windows also. I love the bedrooms especially the kids room so well decorated, problem I found in there though was because the violin was placed inbetween the bed my sims couldnt actually use the beds so make sure you sim test everything. Overall though @popettypop2012 it looks super cute inside and out and other than a few placement issues I think you did a wonderful job decorating. @popettypop2012 I'll just add a few things I noticed to what @Cbear13 said. For now only on the landscaping. Let's start with the pond. I noticed you had some bushes that dropped to the ground in the basement. I suppose you had them partly placed in the fountain but not enough for them to stay raised. 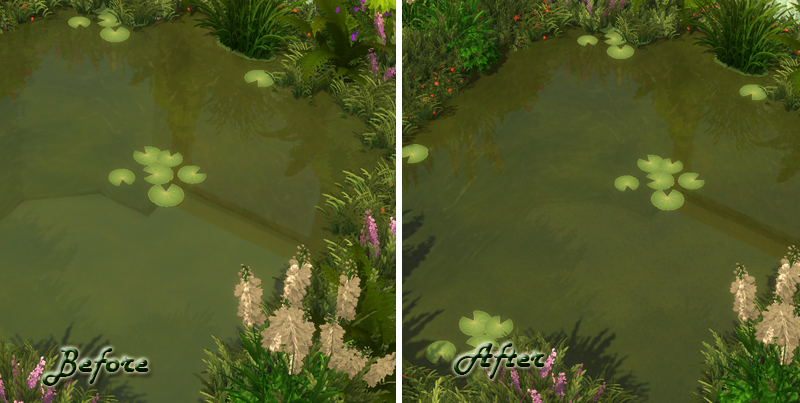 To get an even more natural look for the pond you could use one of the pool edges, I chose the brown one, and make it blend in with some terrain paint. 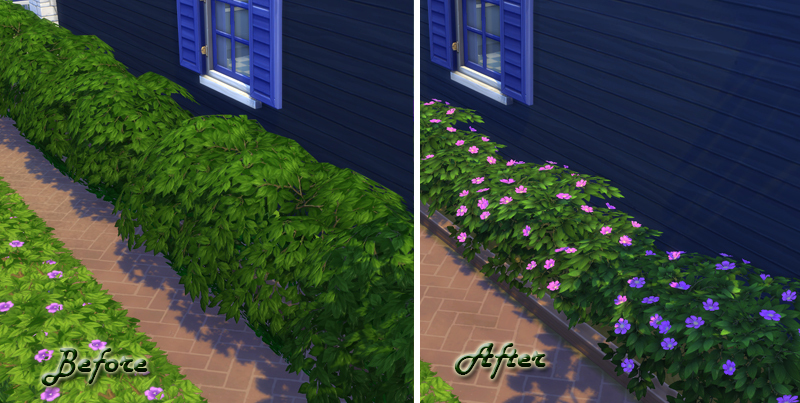 The tall hedge you used next to the path did bother me a little. It felt to huge for that small area. 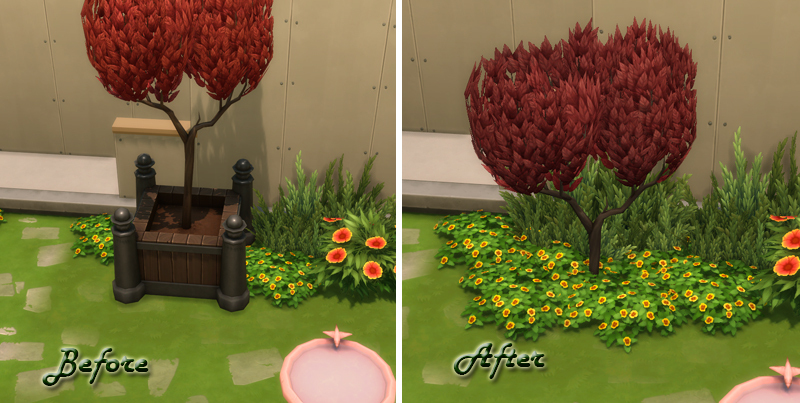 I replaced it with a smaller one that has flowers and choose a colour for the blossoms that fits with the fence. For this one I did several adjustments. The brown fencing doesn't really fit with your colour scheme, so replacing it with a white one would be better. 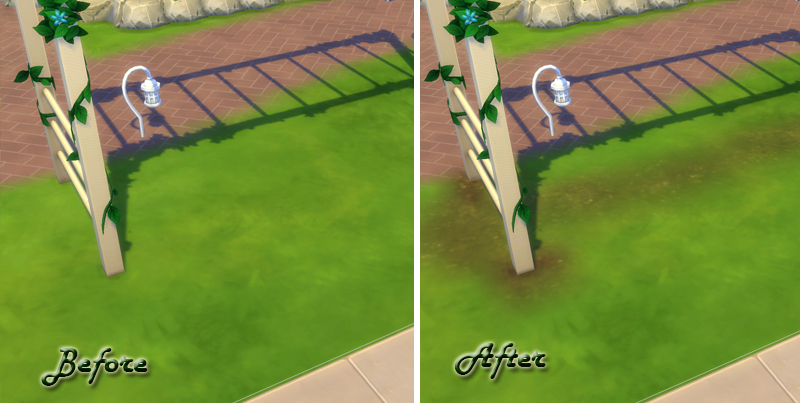 The bar did overlap with the fence so I moved it a little with ALT. I also moved the BBQ a bit closer to the house. 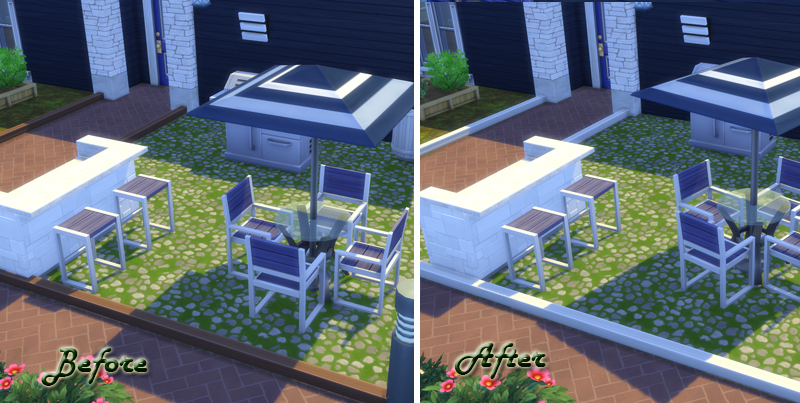 Another thing is that I moved the table a bit more in the patio and turned it around with ALT. 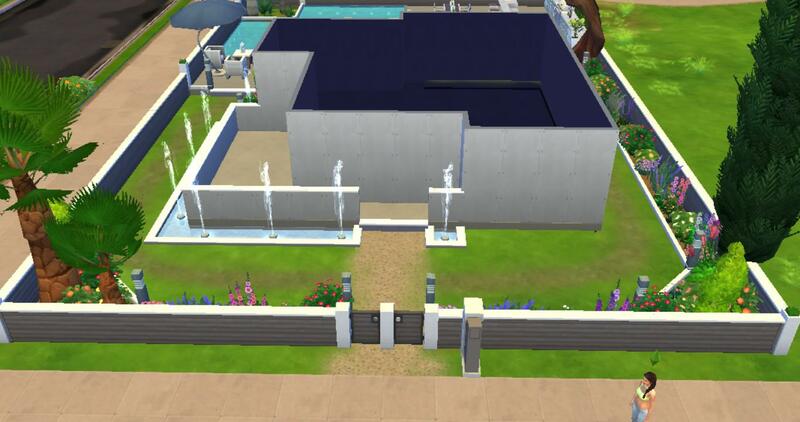 One thing you can't really see on this picture is that I had the whole area filled out with the terrain paint you chose, as there were some holes and it didn't align with the wall and fence. Having the lights all face towards the path is something I feel looks better. The last things I have are related to terrain paint. Having the path go all the way to the rocks feels prettier for me. 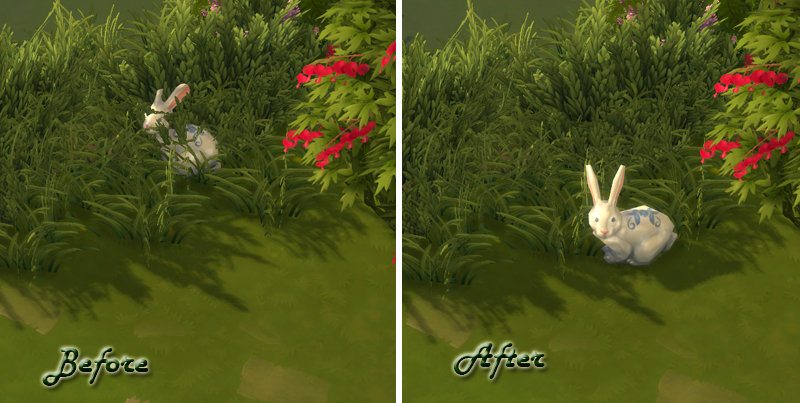 Same with adding some terrain paint under plants. It looks far more natural. 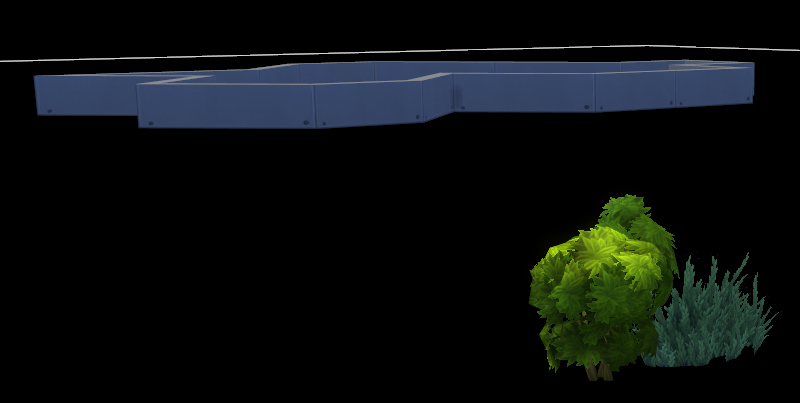 Adding some earthy terrain below the monkey bars, make them look used alot. 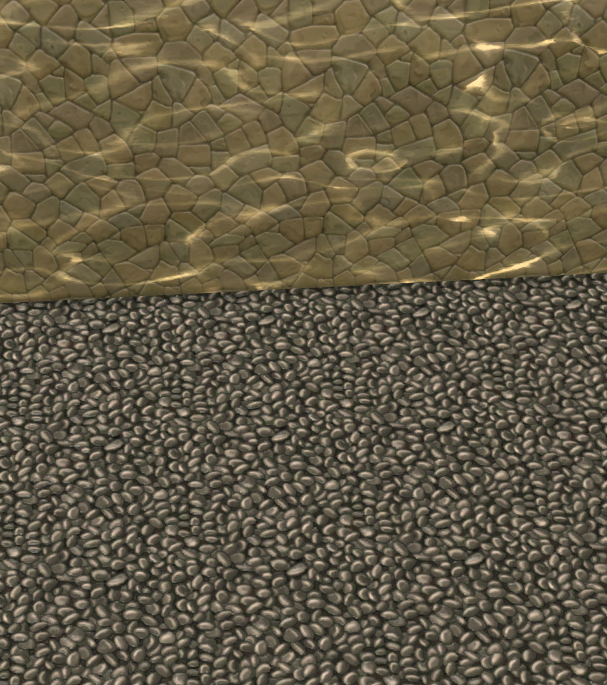 Another terrain to add here could be sand that way the bars would be standing on a sand bed. I've left the front wall of the house quite bare as I want to wait until I've done windows etc before choosing what to place there. @Cbear13 Thanks for the link, I couldn't figure out where to get that. 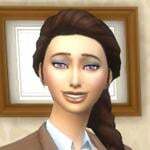 Been playing Sims since sims2 and rarely uploaded anything and never a lot. And no worries, take your time. Its the first warm weekend here in the east coast so I'm taking advantage of it. @popettypop2012 I don't really have much to add to what @Cbear13 said about Exterior and Interior. Maybe except that I prefer more cluttered kitchens and would have added some more wall decorations for kids in the childrens room. I found some items sticking through eachother. Pay attention to that. 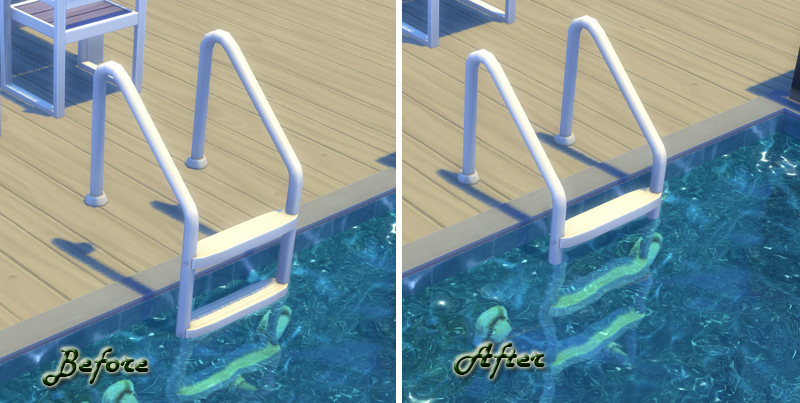 You also need to make sure to playtest, the gras didn't let my Sim enter the pool. Deleting one or two solves that. 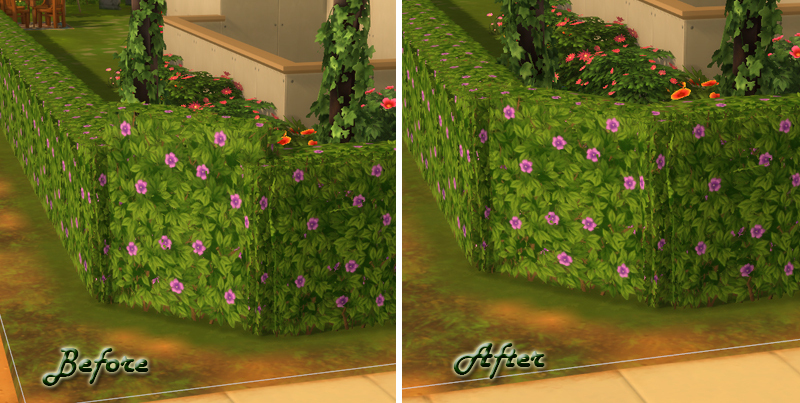 I noticed the hedge in the corners had a different size. If that was intended I apologize, but it felt weird. You have a great natural pond, and I like the creative use of those potted wall flowers. 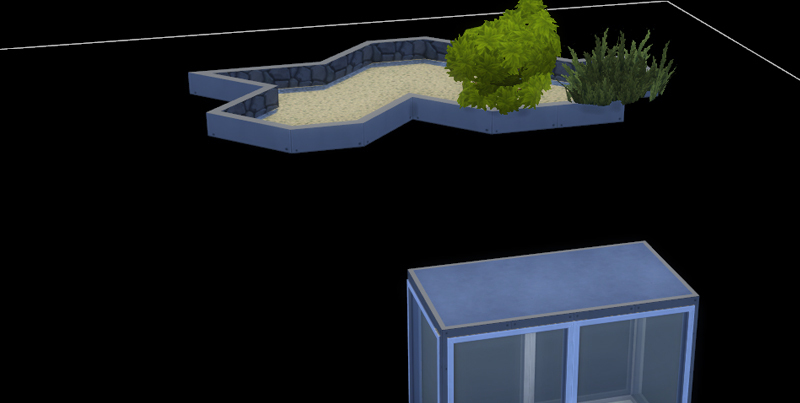 But to give the pool a more natural look add some natural walls and floor to it. 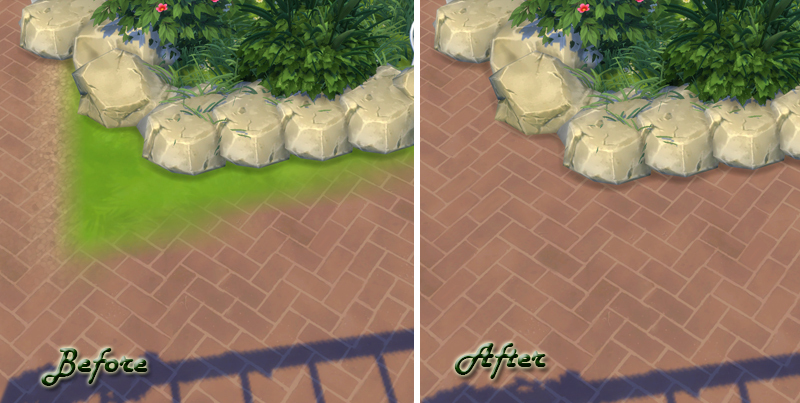 I gave this tip most people so far, add some earthy terrain paint below plants and arears Sims use alot. This looks more natural. And the last thing are the trees at the front. The pot they are in somehow feels out of place. I suggest hidding it in a basement room or use something else. That's it from me. I think @Cbear13 might find more. @steskens my. I spot a selfmade fireplace that surrounding rocks, are those the olives from "get together"? Haha, yeah I guessed that much *whispers* my fireplaces were inspired by some I saw in @BryonyRae thread. Thank you @VioletRed, yes I'm trying a more modern style as I normally go for more country style. I like the style you've done for your build. @Amiejaidenalbie_1988 I like your modern approach I know you said, that you wanted to wait until we do the exterior and placed the windows. But I personally think you still could have extended the fountain a the front. But that's only a personal opinion. I only found two things that you need to pay a bit attention to. 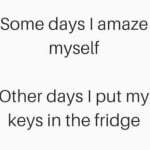 One is the occasional sticking through item. And the other was a floating pool ladder. The other two things that slightly bugged me are really just a personal opinion. 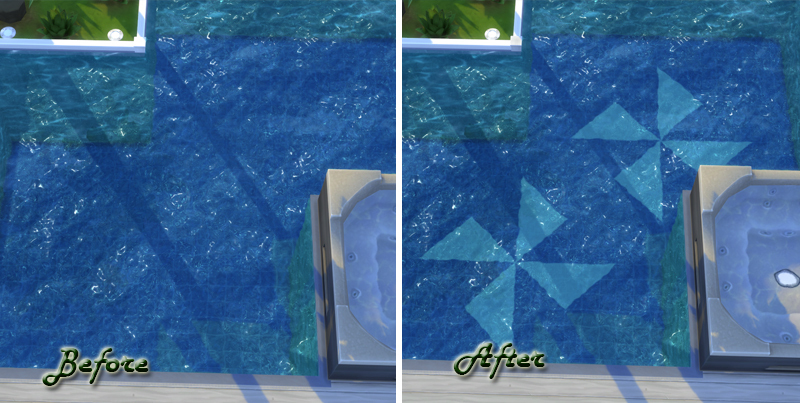 First I would have added a design to the pool floor. 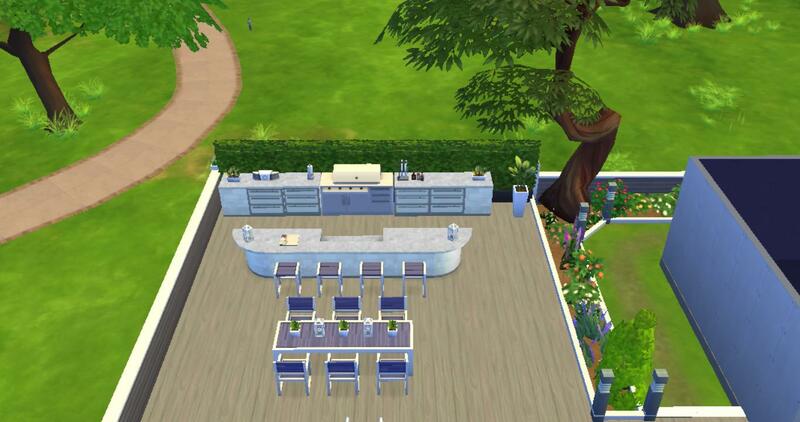 And the other is that I would have centered the BBQ and bar a bit more. But those two aren't really needed.